Thank you all so much for your blorgthday/blogiversary wishes last week! I've had such fun reading about all the little things in life that put a smile on everyone's face--thanks for sharing! The winner of the giveaway is announced at the bottom of this post before the jump to the recipe. The weather around here has finally gotten the memo that it should be autumn, and we've been blessed with mornings of cloudy and moody skies, which, as a SF Bay Area native, I absolutely adore. (Trust me, fog is awesome.) And finally, finally, we're starting to see the first hints of fall in the farmers' markets too, with apples and pears and pomegranates (though I can't complain about the sweet, late-season berries that are still floating around)! Ah, love. Autumn and spring have always been my favorite seasons--times of transition when you can basically have it all, unlike the drastic hots and colds of summer and winter. 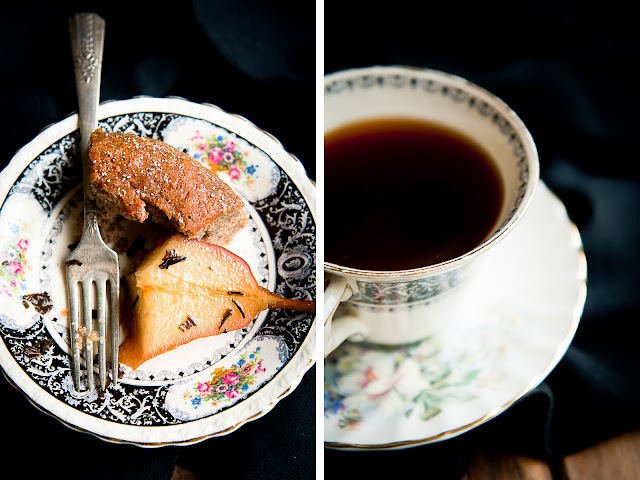 The idea for this pear buckwheat cake with tea-poached pears has been floating around in my mind for a while now, but I kept wanting to wait until the weather had just enough crispness to it to enjoy this cake with a steaming cup of black tea in hand, thinking back on the endless mug of oolong tea that my grandfather never failed to have with him. 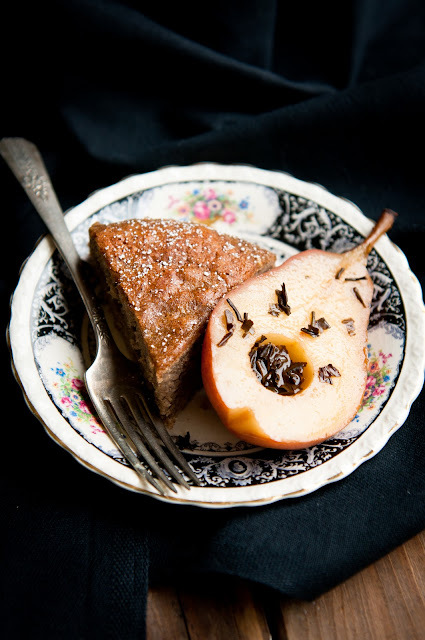 This cake is inspired by a recipe of David Lebovitz's for buckwheat cake with poached cider apples, though it's been very heavily modified by me. 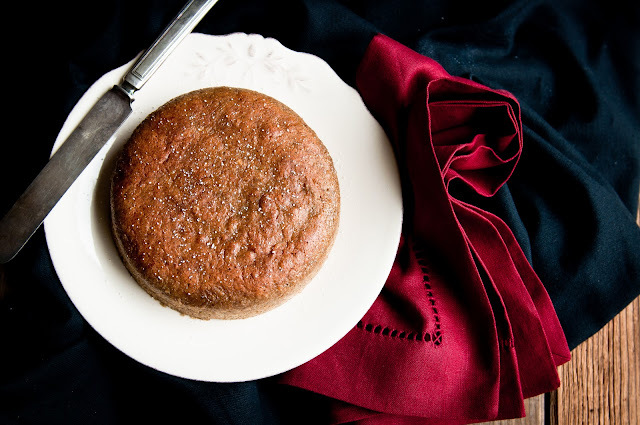 For a buckwheat cake (that's completely gluten free, too! ), it's surprisingly delicate and airy, thanks to the whipped egg whites. It's also surprisingly moist, from the homemade pear sauce that's added in, which balances out the nuttiness and the texture of the almonds and buckwheat. 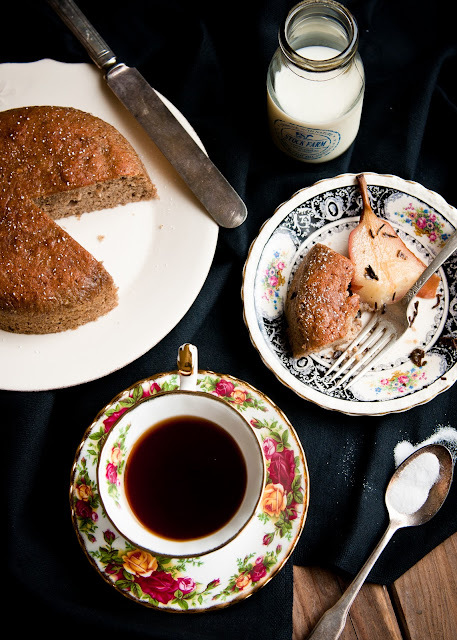 The cinnamon and brown sugar lend the cake a perfect hint of spice, and I wouldn't have it without a side of sweet black tea-poached pears that are tender enough to cut through with a fork and work perfectly with the earthy buckwheat cake. This cake would probably also go really nicely with a dollop of lightly-sweetened whipped cream and macerated strawberries, if you're lucky to be somewhere that still has fresh berries in the markets. Ah--and a cup of tea on the side. Don't forget that one. I should also take a moment to thank my friend, Middy, for kindly allowing me to borrow a few teacups and saucers from her amazing collection to photograph. When Middy got married this past summer (I made the cake! 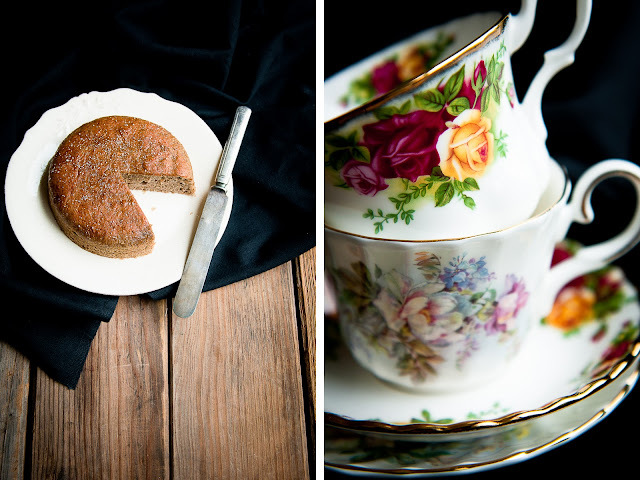 ), she had these tea party bridal showers for which people brought her teacups and saucers from all walks of life. Ever since then, I've been hankering for an excuse to photograph some of her collection and finally was able to come up with a suitable reason. :-) Thanks, Middy! Now, onto the giveaway winner-- congratulations, Eve! An email is on its way to you. Thanks to all for participating. Make sure to keep your eye out on the blog--there's more fun to come, I promise! 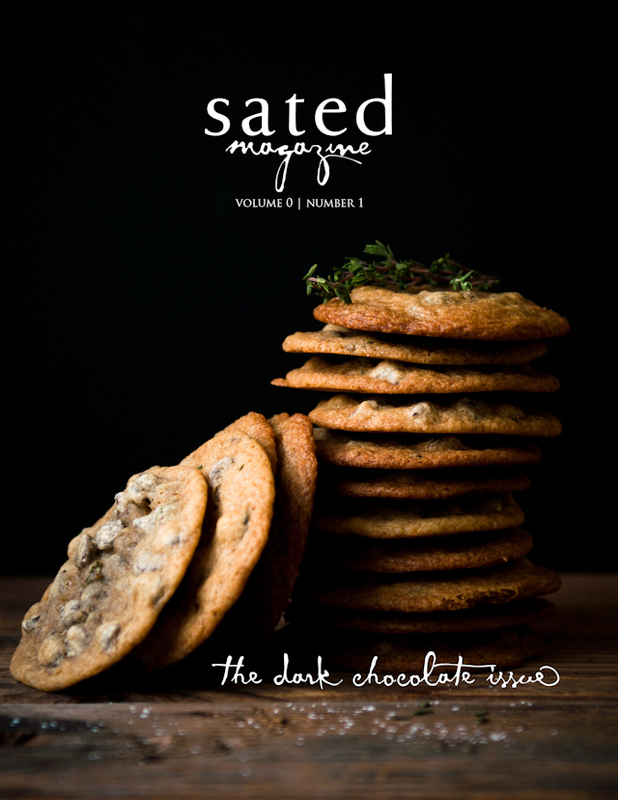 inspired by and very loosely adapted from David Lebovitz's Ripe for Dessert . 1. Combine the pears and water in a saucepan with a tight-fitting lid. Bring to a simmer and let simmer, covered, until the pears are completely tender, about 10-20 minutes depending on the size of the pears. 2. Remove from heat and let cool briefly. 3. Transfer the pears and water into a food processor or blender and blend until completely smooth. Store in the refrigerator (or can properly). You'll only need about 1/2 cup of pear sauce for the cake recipe. 1. Preheat oven to 350 degrees F. Grease and flour a 9" cake pan and line the bottom with a parchment paper round. Wrap with a bake-even strip , if desired. 2. In the food processor, combine and pulse the almonds, buckwheat flour, baking powder, and cinnamon until the almonds are finely ground. 3. In a mixer bowl, cream the butter and light brown sugar on medium for about 2-3 minutes, until light and fluffy. Gradually add in the pear sauce, vanilla extract, and 4 egg yolks--one at a time, combining between each addition. 4. Place the egg yolks in a separate bowl with the salt and cream of tartar. Stir the egg whites with a whisk until the surface is completely covered with foam. Then, beat the egg whites, gradually adding the granulated sugar, until glossy peaks are reached. 5. Mix the buckwheat flour mixture into the butter mixture until combined. Stir in 1/3 of the egg whites until nearly combined and then carefully fold in the rest of the egg whites. Do not overmix! 6. Immediately transfer the batter into the prepared cake pan. Bake for ~45 minutes (~35 for a 6" cake) until a toothpick inserted in the center of the cake comes out cleanly. Remove the cake from the oven and let cool for ten minutes on a cooling rack before removing from the pan. Let cool completely. Sprinkle cake with powdered sugar, if desired. 1. Cut the pears in half and use a melon baller to remove the seeds. 2. In a medium saucepan, bring the water just to a simmer. Add the tea and sugar and stir until the sugar dissolves. 3. 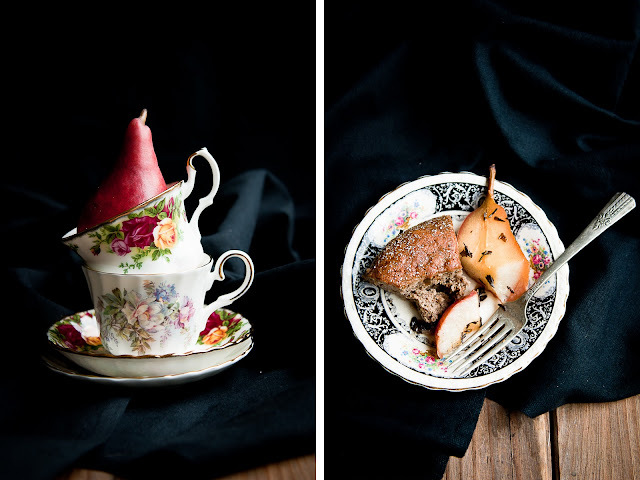 Poach the halved pears in the tea, simmering until the pears are fork-tender, about 10-20 minutes, depending on the size of the pears. 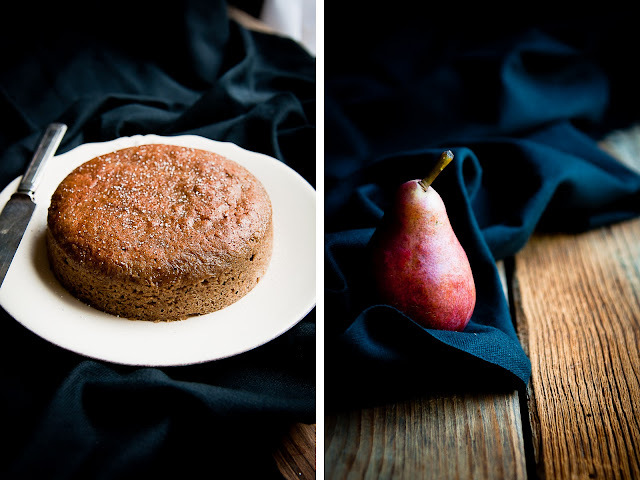 Once pears are done, drain and serve with cake. *How many pears you'd like to serve is up to you. Four cups of water will probably accommodate about four whole medium-sized pears, so make sure to scale the recipe up or down and needed. I can't get over how beautiful your photos are! Absolutely gorgeous! 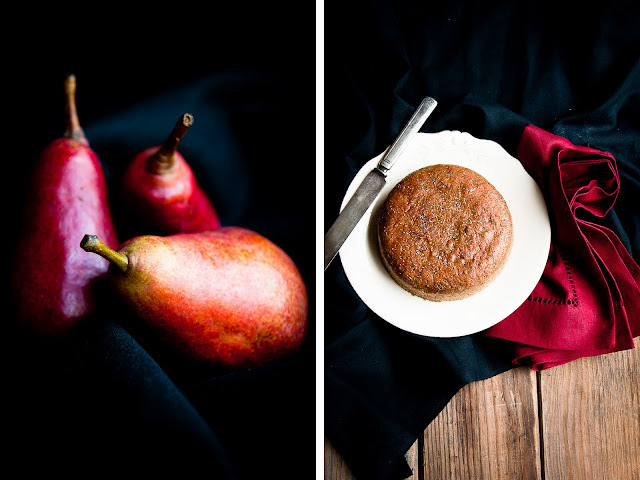 The pear photos are outstanding. Your photos are always gorgeous -- do you use natural light or some sort of lighting kit? What a lovely cake for fall, Steph. And it's so nice hearing about how you learned to cook from your granddad. Mine was a mighty fine cook, too, and I wish I'd learned to make his signature dishes from him while he was still healthy. 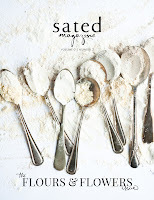 I have been baking with different kinds of flour and loving it - I'll be trying this recipe! Beautiful! Beautiful photography, this looks delicious! Wow, I have just found your site through the adopt-a-blogger website and Kirsten is right. You have a beautiful site with amazing images and food ideas. I will be adding your website to my blog roll so I can keep up to date with what you are cooking. @Frau Sonntag: Ooo, if you do try it with apples, please make sure to let me know how it goes! @sarah marie: natural light, always. @Patricia: I've yet to venture very far into other types of flour, but I do love the texture of buckwheat! Just gorgeous. I love it. Omg this is one of my favorite cakes ever! I could literally eat this cake every morning, afternoon, evening--you name it. Sometime I'll have to actually make the pears! I usually top it with plain yogurt and maple syrup. Beautiful teacups! mm, this sounds delicious! The photos are really stunning too. Yum. This cake sounds amazing. I love the use of buckwheat. Beautiful photos. Hope you don´t mind, i mentioned you on my blog, i just wanted to share this sweet place with my friends and readers. Your blog is so pretty. You're going in my reader now! Love your photos and the cake sounds and looks delicious. Off to track down buckwheat in Beijing now! I bought buckwheat to make pancakes recently and wasn't sure what to do with the big bag I have sitting in my cupboard. This recipe sounds perfect :-) thanks!